Seventeen-year-old Webb Thompson and his younger sister Sundown awoke to find themselves not in their own beds, but in a bizarre landscape with field upon field of grass stretching in all directions. The sky was black overhead and it seemed like a storm was moving quickly toward them. They have awoken in the Dark Lands; a place between the world of the living and the land of the dead. Are they alive? Are they dead? Or, like the place they find themselves in, are they something in between. 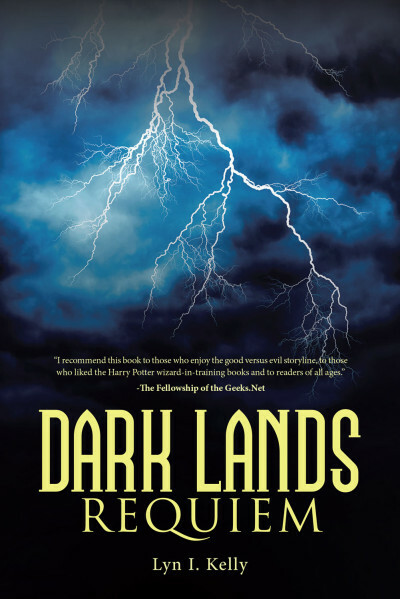 They soon discover that the Dark Lands are entrenched in a battle between good and evil. To make matters worse, Webb and Sundown have hidden powers that will be needed if the evil Dark Man is to be stopped. Author Lyn I. Kelly has crafted an intense supernatural thriller populated with new and interesting creatures as well as with many fascinating characters. This book will be enjoyed by readers who loved the Harry Potter series and those that want a Young Adult book with some “bite” to it. The landscape of the Dark Lands is as diverse as it is terrifying. In a land where the good guys (the Glorians) must maintain a delicate balance. It is their job to ensure that the Dark Man and his minions never breach the walls of their fortress nor tip the scales so that evil outweighs goodness. I enjoyed the book and found the characters to be believable. Webb is a typical teenager insofar as he is impulsive and has a hard time reigning in extreme emotions – especially anger. Think about it! Wouldn’t you be pretty angry if you woke up to find out that you were dead and that you would never see or speak to your family and friends ever again? Webb must learn to control his anger lest the Dark Man use it to take control. The storyline moves along at a decent pace and although I found certain elements of the story to be predictable, I still enjoyed the read. Lyn I. Kelly is a graduate of the University of Texas in Austin. Writing since the age of eleven, he has been published in Diamond Comics, Newsweek and more. When he’s not writing or spending time with his wife and four children, he is also a marathoner. Kelly resides in Keller, Texas. Dark Lands: Requiem is his first novel.